Lincoln State Senator Bill Avery wants Nebraska to follow Iowa’s lead and have an annual tax holiday during the back-to-school shopping season. It seems like an awfully Omaha-centric proposal. Who, besides folks in the Omaha metro, rushes to Iowa to shop every year? Consider folks driving from Lincoln. Let’s say you spend $15 on gas getting to Council Bluffs and back. If you save 5% on taxes, you would need to spend $300 just to break even. And that’s without factoring in the two hours of time you just lost. You don’t value your time at $0/hour, do you? Maybe the problem is much greater in Omaha. But is it great enough that we would recoup the costs of applying this program across the state? Where’s an economist when you really need one? Avery says he’s “tired of seeing parking lots in Council Bluffs full of cars with Nebraska license plates” and that he can’t blame Nebraskans for crossing the river. he plans to introduce a bill for a sales tax holiday next legislative session. Well now I’m curious. What is Bill Avery doing hanging out at Council Bluffs shopping malls? It’s time to do your civic duty, folks, and study up on the proposed City budget. You might start with the Mayor’s proposal (summary [PDF]), and then move on to the Council’s version (summary [PDF]). The City Council’s budget session is Monday, August 11 at 2:30pm, so if you’ve got something to say, that’s your time to do it. The Journal Star announced yesterday it has laid off 16 employees. Times they are a changin’ in the news industry, and this is just one symptom. The LJS still employs 424, so this isn’t a huge reduction, though try telling that to the folks who got laid off. Interestingly, the very first commenter on the story suggests charging for online subscriptions. I’m sure the LJS is considering that. I’m not so sure that would be a good idea. Many media organizations much larger than the Journal Star have dropped or scaled-back their pay-for-content plans because they found that they weren’t as profitable as anticipated. Ribfest is coming up next weekend, August 7 - 10. How many of you would be able to make it over the lunch hour on either Thursday or Friday? I’ll even pay your admission fee! That’s on top of my regular workload. For example, last week I began working with a local small business to develop their first ever website. We haven’t signed a contract yet, but that should come this week or next. Then there’s soccer. Last week, for instance, Nebraska Rush hosted other Rush clubs from around the country—Colorado, Michigan, Virginia, Arkansas, California, Hawaii—as part of a four-day clinic. They began each morning with games, so I got to help out there. And of course there are the family responsibilities. Two year olds are awesome, but they do take time, don’t they? Robbie is on Day 3 of going diaper-less in the daytime. I’m not sure we’re welcome back in Barnes & Noble any more, but other than that, he is doing great! Not that I’m trying to make excuses. I just don’t want you to think I’m sick, or burning out, or bored, or anything like that. It’s just the classic problem of too many responsibilities to fit into too few hours. I’ll have things back up to full speed just as soon as I can. 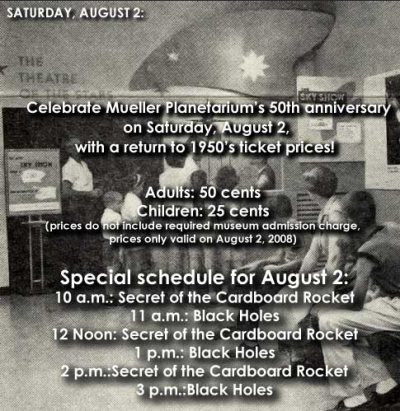 Mueller Planetarium is 50 years old. To celebrate, admission prices are being discounted to $0.50 for adults and $0.25 for kids this Saturday, August 2. If you haven’t been to the planetarium in a while—or if you *gasp! * have never been—this might be a good weekend to check it out. OK, thieves of Lincoln, it’s time for you to explain yourselves. Who the heck steals a Daewoo? Twice?! It is up to Mayor Beutler now to either continue the three year U-Stop saga at 21st and K, or give the project the thumbs-up after the City Council voted to do just that. This has to be one of the most micromanaged gas station projects in Lincoln’s history. The project has met all zoning restrictions and other regulations since Day 1, and yet the City has given the developer fits, preferring an empty parking lot over a $3.5 million development. Can we just finish this thing already? The New York Times has a nifty article on the front page of today’s sports section about Lincoln’s own Agile Sports. Congratulations, guys! If your garden is like mine, you’re probably seeing the fruits of your labors by now. What’s coming up in your garden? We have had some really nice cucumbers so far, a bunch of Hungarian yellow wax peppers, and a few cayenne and serrano chiles. My anaheim chiles are close to being ready, as are several varieties of sweet peppers. But the items I’m really concerned about? My three plants worth of habaneros. There are dozens of fruits on the plants. What the heck am I going to do with dozens of habaneros? Has LES Waited Too Long to Hop on the Wind Bandwagon? In a Sunday letter to the editor, Ron Kriha accuses LES of “not having the foresight” to explore so-called “alternative” energy sources. Given LES’s request for a 10% rate hike, Mr. Kriha is not alone in his sentiments. I wonder if he is correct. Has LES waited too long to aggressively pursue new power generation possibilities? Given all of the current uncertainties about gas prices and electricity rates, it’s easy to say yes. Time will tell if the numbers support that answer. After all, the costs of generating electricity from “green” (or “greener”) sources are just now coming down. Wind power costs have dropped to one-fifth their amount in the 1980’s, for example. An earlier switch would have meant higher initial costs. In fact, maybe costs are still too high for LES, relative to the alternatives. I would love to see those numbers worked out. Anyway, while we’re busy pointing fingers at the utility, surely we also have to point into a mirror. Lincolnites certainly haven’t been clamoring for change. Quite the contrary; we’ve been content to sit back and enjoy our low rates with barely a peep about looking too far into the future. We may always want the latest and greatest facilities for our Husker athletic events, but we aren’t exactly the types to clamor to be among the early adopters of new and expensive power generation techniques and technologies. If you’re curious, here’s a simple comparison of costs among various forms of electricity generation. According to those numbers, wind is much more competitive today than the last time I looked at cost comparisons. Remember, though, that those numbers are generalizations. Does anybody know how they compare to our actual local costs? Nikki once again correctly identified where this picture was taken. Way to go Nikki! Your encyclopedia-like knowledge of Lincoln is impressive. I know almost nothing about it, but I hear Carmela’s Bistro and Wine Bar is open at 70th and Pioneers Boulevard. Our insurance agent told The Missus that he was headed to Venue the other day, but instead went to Carmela’s when he saw it was open. He described it as American with a bit of an Italian flair. He said it reminded him of Vincenzo’s, but less Italian-y. He said it was one of the better dining experiences in Lincoln. With that brief, second-hand introduction in mind, let us know if you visit Carmela’s. Or maybe you haven’t been there but you know more about it. Please share.